Melbourne Rebels coach Rod Macqueen is set to stand down following the club's final Super Rugby match of the season against Western Force this weekend. 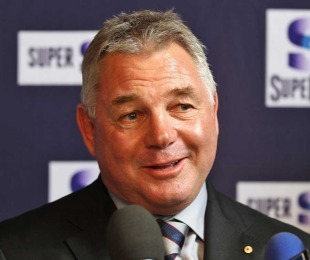 The former Wallabies boss has refused to confirm or deny the news but a club spokesperson told a Melbourne radio station that the World Cup winner would quit his post at the end of the season. "This week we really want to concentrate on the last game, obviously it's going to be very important to us," Macqueen said. "But next week we will be announcing exactly what's happening." It is understood Macqueen, who came out of retirement to lead the Rebels through their inaugural season, will pass the baton onto highly-regarded assistant Damien Hill. Hill boasts an outstanding coaching pedigree, having led Sydney University to five consecutive premierships before heading south to learn under the 1999 World Cup-winning mentor this season. But Macqueen is expected to remain within the organisation for 2012 in a director of rugby role. "We like to do things our way, we're looking to see how that's going to work," Macqueen said. "There's been some very good positives to come out of the first year, we've done a lot of things right off the field and got a very good presence in Melbourne. We've got to take what we've learnt this year and put it on the paddock next year." Macqueen has guided the Rebels to a 3-12 win-loss record, and while that means the new boys have won the wooden-spoon, they also boast the most successful first-season record by an expansion club in Super Rugby. "It's been a great challenge, I came here with my eyes open and what hasn't let me down is the Melbourne public and the way they've embraced rugby," Macqueen said. "Three wins, we want to do better than that - if you want to measure it and this season's about measurement - we've done better than any other franchise (in their first year), so you could say we did better than expected."